Welcome to the TRAIN TUNNEL!!!! They say a good train display is never completed !!! Here are some pictures of the progress being made by John Groters and his friends. John's Dad was Ray Groters ( the TRAINMAN) who passed away last July (click on the toy collectors tab) so now John is continuing the work he and his Dad started. There was a dedication at the Erie County Historical Society's Watson Curtze Mansion on November 17, 2007 honoring the many years the Groters family has been involved volunteering in the community. The mansion is at 6th & Chestnut Street in Erie PA and that is where the display is located. We made a train (MARX copy) and placed it on the front lawn for the holiday season. Write us with your comments or ideas and as always --- HAVE FUN !!!!!!!!! Click on the photos below to enlarge them!! HELLO AGAIN TRAIN PEOPLE !! Here are some pictures of the progress at the TRAIN TUNNEL. 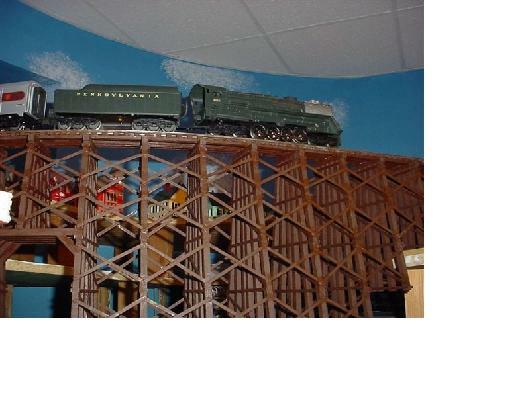 We have also included a picture of a layout the GROTER'S have placed in the ERIE CHILDRENS MUSEUM! This layout is on a six foot square table. The children may run the two tracks and the airport tower by a set of switches at the control panel. They, the GROTERS, change the theme for the various holidays through-out the year. YES, those are Unique Art Toy Co. airplane & blimp flying over the building!! John Groters has been busy working on the display at the Watson Curtze Mansion! He is making mountains from foam spray and uses an electric knife to shape the cliffs. The set-up gets a lot of use and they had to rebuild one engine to date. More news to come. Stop in and have fun with both of the lay-outs!!! We are excited to announce the opening of the TRAIN TUNNEL at the Watson Curtze Mansion--lower level!! The address is 356 West 6th Street Erie, PA 16507. We are told that a train layout is never finished so here is what we have built so far...the dimensions are sixteen feet wide and ten feet deep. It has three levels with three seperate train layouts and trains. The first level has moving gates, lighted buildings, scenery and an Alaska passenger train. The train travels through tunnels under the second level. The next level has typical assessories and a train hauling product. The top level has a train which travels through a farm then an urban setting and travels into a town typical of the late 1800's. You can see the steam engine in the picture of the tressel!!! THE TRESSEL---is 62 inches long X 14 inches tall. It was made from 1/8" X 3/8" wood strips glued together. There are 960" of lamanated supports---1206" of cross bracing---682" of decking. 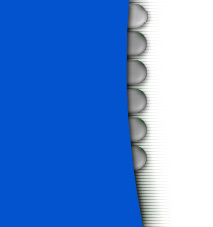 There are more than 2000 pin heads cut to lenght and pressed in at the appropriate places. The tressel was built by John Groters. He guessed he had more than 80 hours in construction!!!! The color was produced from SHERWIN WILLIAMS wiping stain. It is called SHERWOOD wiping stain and it is a perfect color for the timbers!! 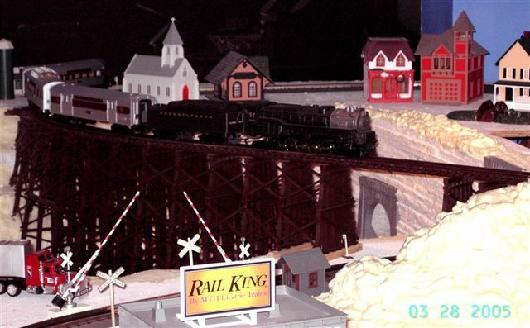 The layout was produced by John and his dad, THE TRAINMAN Raymond Groters. Most train people have heard of Ray. He has been active in the hobby for his lifetime. Also involved was Rays' wife Carole. We have tours and lectures by our local train experts. At this time we are building an engine cab. It will have all the bells and whistles that a person may sit at (on a real train stool!) and run the displays!!! It's good to have the world's largest train engine manufacturer in your home town!!!!!!!!!!! Watch for up-dates and call 1-814-871-5790 for operating hours or write us. Click on the pictures below to supersize them!! on line!!! We respect your privacy!!!!!! Please write us--we enjoy the world of toys!!! To answer or ask a question click here!!!!! !